Thank goodness for washing machines is all I can say! 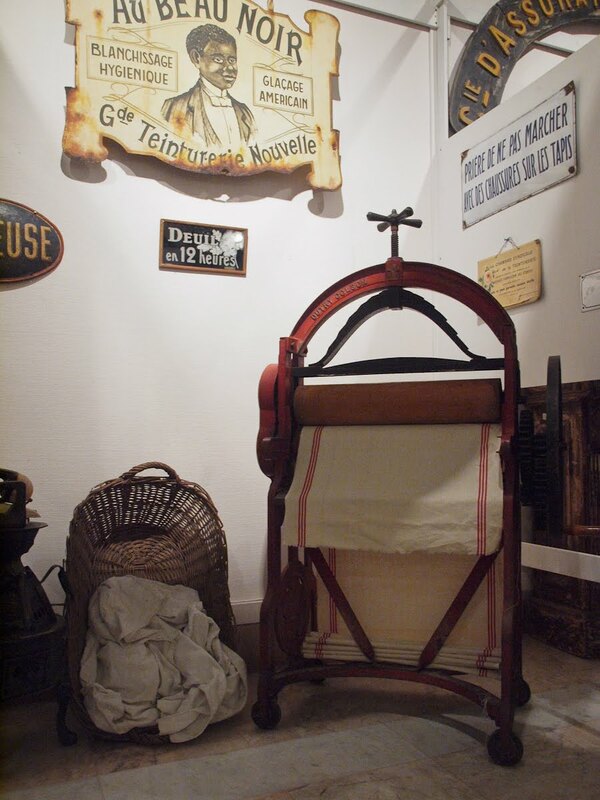 Teinturie means drycleaners or laundry and is a word still used today even though blanchisserie or laverie is more common. Glaçage americain refers to a special way of starching collars, shirts, headgear etc. A mix was made of raw starch and borax. The final result is a very crisp and shiny fabric. The name of the company 'Au Beau Noir' is, of course, totally politically incorrect these days - it reflected the spirit of the colonial era in Africa at the time. Dieu merci pour les machines à laver c' est tout ce que je peux dire! Le glaçage américain était un procédé spécial pour de empeser les cols, les chemises,les coiffes en dentelle..... On utilisait un mélange d' amidon cru et de borax puis on repassait avec un fer à glacer. Le résultat final est un tissu impeccable, raide et très brillant. Le nom de la société "Au Beau Noir» est, bien sûr, totalement politiquement incorrect de nos jours et il reflète l'esprit coloniale en Afrique à l'époque. My grandmother(born in 1896) used to say that electricity , and then washing machines , were the greatest inventions of the XXth century!Seeing that, it's easy to understand why.. I'll second Malyss. I love my washing machine. Your post today reflects an amazing era which seems soooo long gone. 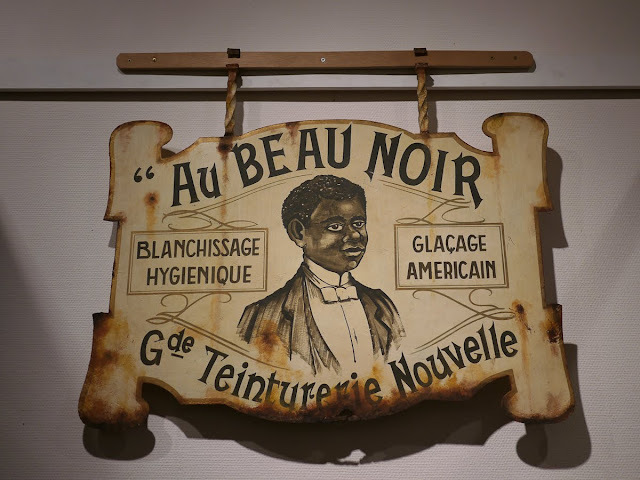 "Au beau noir" ? I am glad that today it seems not only politically incorrect but just so plain odd to give a shop such a name. Thank goodness for the laundromat down the road that does all mine for me. It is odd to see the ethnic references to cleaning, including the description of a cleaning method as American. In the USA at the time, particularly in the West, the laundries were often Chinese. 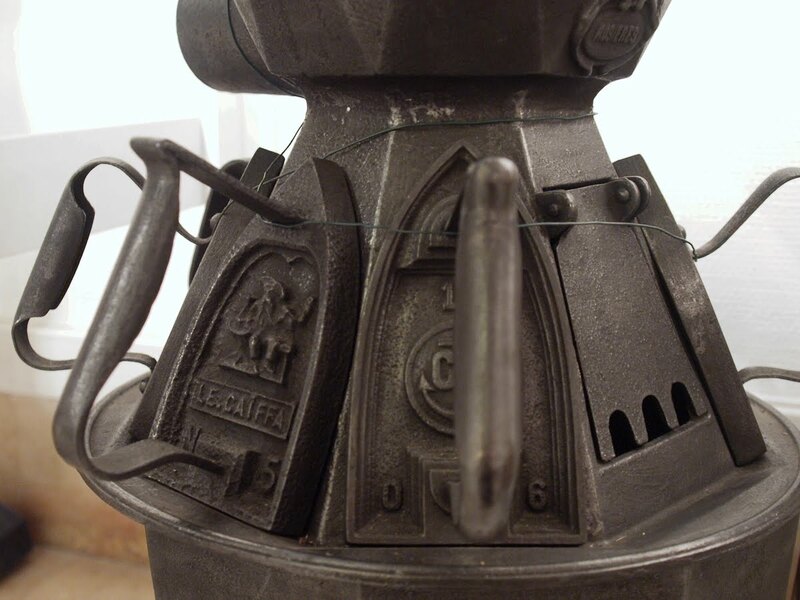 Regarding the earlier era of doing laundry, my father told us that when he grew up in a small town in Ohio in the 1920's they had gasoline engine washing machines, so they had to be placed on the porch because of the fumes. His mother, like the other women in the neighborhood, would start soaking all of their clothes on Sunday night so that she could start up the machine early Monday morning because everyone in the neighborhood could hear when each woman started up their machine. None of the women wanted to appear lazy by being slow to start up the Monday morning washing. Blogtrotter Two has a surprse for you! Enjoy and have a great weekend! Love the remembrance and story from Dave. I will join the throng grateful for washing machines. We lived on the Rue Longue for 6 months before ours was installed - in our tiny bathroom! After a few weeks of hauling our clothes to the laverie near the Mairie in suit cases, and spending over 8 Euros a load, I started washing at home. It took me hours to soak, wash, rinse, and wring in my kitchen sink. Then I hung them out over the Rue Longue on 4 little wash lines, covered with a sheet of plastic to protect them from pidgeons and the dripping laundry from my upstairs neighbor. I will always be grateful to my landlord who hauled that washer up 3 flights of steep twisting stairs with his son - during La Chaleur! All the buttons were marked in Italian, but it was a minor setback to clean living. Love your story, Dave and goodness, Karen,I can't even imagine lugging laundry all that way and up and down stairs too. I know how steep those stairways are on Rue Longue. Am glad you finally got a machine. I can remember the mangle in England - all the washing had to be passed through this to get rid of excess water. But really they used to come in very useful if we were without electricity for extended periods after hurricanes.